Spanish cabalist; born at Medinaceli, Old Castile, 1248; died at Peñafiel after 1305. 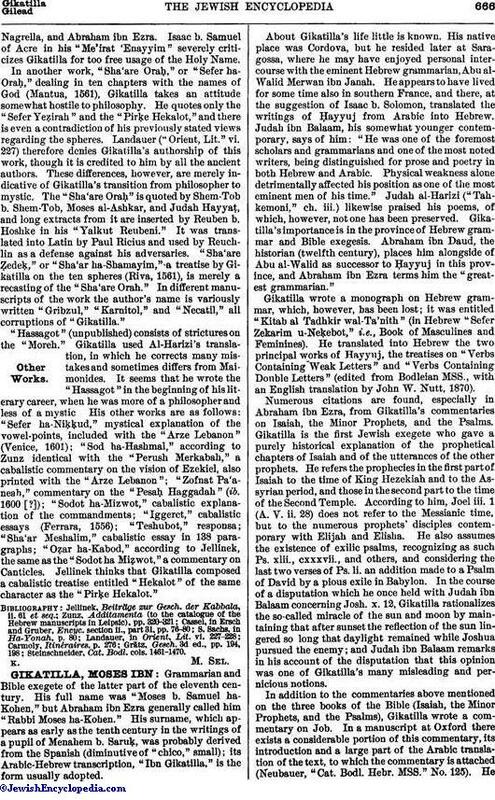 Gikatilla was for some time a pupil of the cabalist Abraham Abulafia, by whom he is highly praised; his cabalistic knowledge became so profound that he was supposed to be able to work miracles, and on this account was called "Joseph Ba'al ha-Nissim" (the Thaumaturge; Zacuto, "Yuḥasin," p. 224a). Like his master, Gikatilla occupied himself with mystic combinations and transpositions of letters and numbers; indeed, Abulafia considered him as the continuator of his school (Jellinek, "B. H." iii. p. xl.). But Gikatilla was not an adversary of philosophy; on the contrary, he tried to reconcile philosophy with the Cabala, declaring that the latter is the foundation of the former. He, however, strove after the higher science, that is, mysticism. His works in general represent a progressive development of philosophical insight into mysticism. His first work shows that he had considerable knowledge of secular sciences, and that he was familiar with the works of Ibn Gabirol, Ibn Ezra, Maimonides, and others. Gikatilla was a prolific writer; he wrote his first work ("Ginnat Egoz") when only twenty-six. It is a cabalistic treatise in three parts (Hanau, 1615). The title (from Cant. vi. 11) means "garden of nuts," "Ginnat" consisting of the initials of "Gemaṭria," "Noṭarḳon," "Temurah" ( ), the three main elements of Cabala, while "Egoz" (the nut) is the emblem of mysticism. The first part, in five chapters, treats of the various names of God occurring in the Bible. 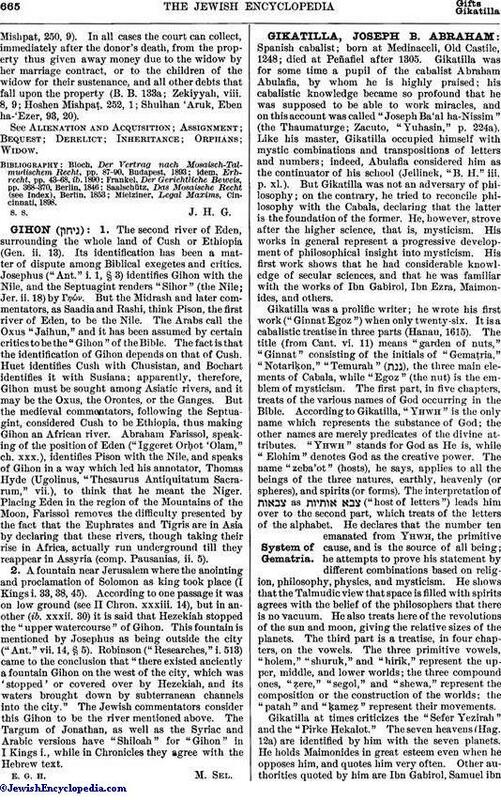 According to Gikatilla, "Yhwh" is the only name which represents the substance of God; the other names are merely predicates of the divine attributes. "Yhwh" stands for God as He is, while "Elohim" denotes God as the creative power. The name "ẓeba'ot" (hosts), he says, applies to all the beings of the three natures, earthly, heavenly (or spheres), and spirits (or forms). The interpretation of as ("host of letters") leads him over to the second part, which treats of the letters of the alphabet. He declares that the number ten emanated from Yhwh, the primitive cause, and is the source of all being; he attempts to prove his statement by different combinations based on religion, philosophy, physics, and mysticism. He shows that the Talmudic view that space is filled with spirits agrees with the belief of the philosophers that there is no vacuum. He also treats here of the revolutions of the sun and moon, giving the relative sizes of the planets. The third part is a treatise, in four chapters, on the vowels. The three primitive vowels, "ḥolem," "shuruḳ," and "ḥiriḳ," represent the upper, middle, and lower worlds; the three compound ones, "ẓere," "segol," and "shewa," represent the composition or the construction of the worlds; the "pataḥ" and "ḳameẓ" represent their movements. Gikatilla at times criticizes the "Sefer Yeẓirah" and the "Pirḳe Hekalot." The seven heavens (Ḥag. 12a) are identified by him with the seven planets. He holds Maimonides in great esteem even when he opposes him, and quotes him very often. Other authorities quoted by him are Ibn Gabirol, Samuel ibnNagrella, and Abraham ibn Ezra. Isaac b. Samuel of Acre in his "Me'irat 'Enayyim" severely criticizes Gikatilla for too free usage of the Holy Name. In another work, "Sha'are Oraḥ," or "Sefer ha-Oraḥ," dealing in ten chapters with the names of God (Mantua, 1561), Gikatilla takes an attitude somewhat hostile to philosophy. He quotes only the "Sefer Yeẓirah" and the "Pirḳe Hekalot," and there is even a contradiction of his previously stated views regarding the spheres. Landauer ("Orient, Lit." vi. 227) therefore denies Gikatilla's authorship of this work, though it is credited to him by all the ancient authors. These differences, however, are merely indicative of Gikatilla's transition from philosopher to mystic. The "Sha'are Oraḥ" is quoted by Shem-Ṭob b. Shem-Ṭob, Moses al-Ashḳar, and Judah Ḥayyaṭ, and long extracts from it are inserted by Reuben b. Hoshke in his "Yalḳuṭ Reubeni." It was translated into Latin by Paul Ricius and used by Reuchlin as a defense against his adversaries. "Sha'are Ẓedeḳ, " or "Sha'ar ha-Shamayim," a treatise by Gikatilla on the ten spheres (Riva, 1561), is merely a recasting of the "Sha'are Oraḥ." In different manuscripts of the work the author's name is variously written "Gribzul," "Karnitol," and "Necatil," all corruptions of "Gikatilla." "Hassagot" (unpublished) consists of strictures on the "Moreh," Gikatilla used Al-Ḥarizi's translation, in which he corrects many mistakes and sometimes differs from Maimonides. It seems that he wrote the "Hassagot" in the beginning of his literary career, when he was more of a philosopher and less of a mystic. His other works are as follows: "Sefer ha-Niḳḳud," mystical explanation of the vowel-points, included with the "Arze Lebanon" (Venice, 1601); "Sod ha-Ḥashmal," according to Zunz identical with the "Perush Merkabah," a cabalistic commentary on the vision of Ezekiel, also printed with the "Arze Lebanon"; "Ẓofnat Pa'aneaḥ," commentary on the "Pesaḥ Haggadah" (ib. 1600 [? ]); "Sodot ha-Miẓwot," cabalistic explanation of the commandments; "Iggeret," cabalistic essays (Feṙrara, 1556); "Teshubot," responsa; "Sha'ar Meshalim," cabalistic essay in 138 paragraphs; "Oẓar ha-Kabod," according to Jellinek, the same as the "Sodot ha-Miẓwot," a commentary on Canticles. Jellinek thinks that Gikatilla composed a cabalistic treatise entitled "Hekalot" of the same character as the "Pirḳe Hekalot." Steinschneider, Cat. Bodl. cols. 1461-1470.